Learning Tabla from past 22 years. Currently taking special training from Sri Dilip Mukherjee, Professor of Rabindra Bharati University since 10 years. Completed Sangeeth Ratna, Sangeeth Bibhakar from Bangiya Sangeet Parisad, Kolkata. 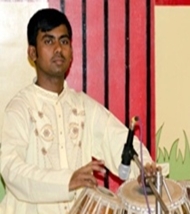 Regularly perform with vocal, Sitar, Sarod, Flute, Violin etc. Attached with Rainbow Music Group, Bangalore. Teaching Tabla since 8 years.